Dr. David Moffet is an international expert in dental practice management. 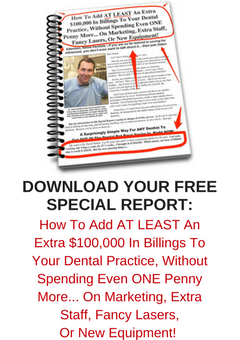 With over 32 years of dental experience, he has developed a simple, practical, and incredibly effective way of increasing the number of patients you see… the amount of money you charge… and the percentage of large case revenues your patients will happily accept. The UPE is a unique, low-cost system of unique patient engagement that is incredibly easy to put in place. In fact, one of Moffet’s strategies costs less than $40 to implement, and you can have it up and running by the end of business, today.